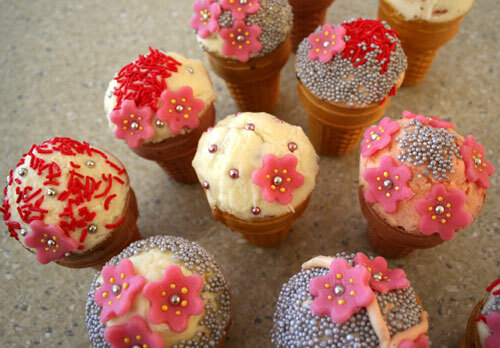 Under the pretext of celebrating Brioni’s birthday, I gave Tuesday’s playgroup another shot with some elaborately decorated buttermilk cupcakes, hoping to seriously impress the other ladies. So I’m officially kooky. I accept that. Here’s how much trouble I went to. 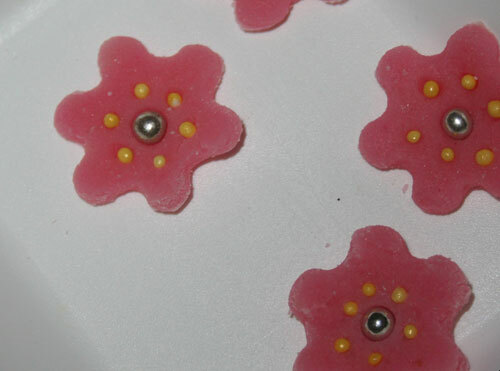 I coloured some marzipan pink, rolled it out, cut out little flowers and then got out yellow sprinkles and silver cachous. On Monday evening, I went to a friend’s place and used their oven to bake the cupcakes (ours doesn’t work/hasn’t worked for years). That took another two hours. Decorating the cupcakes took another couple of hours, so I didn’t get to bed until 11 pm and decorated some more in the morning. 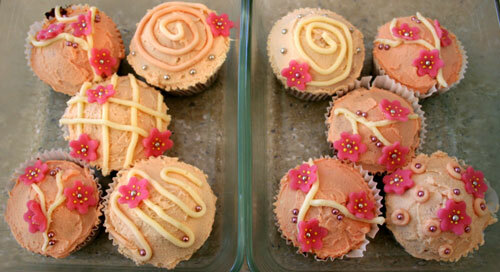 These were the cupcakes that I took to playgroup for the kids. Instead of placing the cupcake mixture in paper cups, I scooped it into icecream cones and baked them on a tray in the oven. 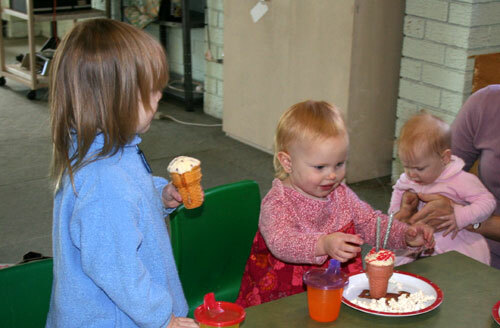 I offered the elaborately decorated ice cream cone cupcakes at playgroup as a “present” to Brioni, who passed them out to the other kids. To celebrate Brioni's birthday at playgroup, I pulled out the candles again. This time she didn't have any trouble blowing them out. And then I also had to organise the craft activity. Determined not to offer another Mummycraft, I remembered that children these ages love gluing things. 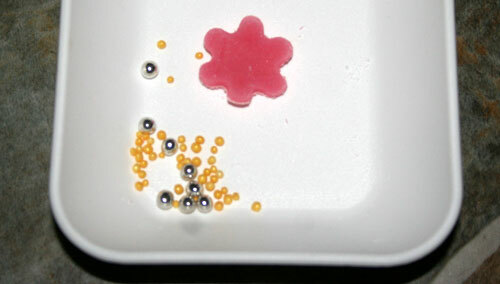 We poured the glue into the little trays and offered cotton buds as glue applicators. 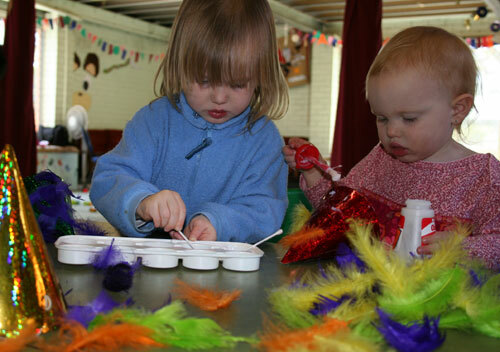 The kids had heaps of fun sticking feathers onto party hats which they then wore with pride. I’ll take some left-over cupcakes tonight to my Bible study and see what kind of response I get. Wow! What lovely cupcakes…Will you be my friend? Wow Lauren, that’s so sad! I think those are gorgeous cupcakes- I can’t believe those girls are so rude! Wish you lived closer so our kids could play together. I think you’re an excellent mom. doh… renee took my responce but will you be my friend anyway. I know that my girls would have been seriously impressed, and i’m sure would wish i’d put that much time into their cakes. Those are seriously impressive cup cakes! I reckon you should find a new playgroup! Oh Lauren, you are such a kind hearted girl … you are a wonderful Mum and you ARE without doubt a great friend!! Hi, i just recently happened upon your blog and am slowly reading it from the beggining and amthis far so far… and ihave to tell you that when i first found your blog the very first thing i looked into was the cupcake button on the right hand side of the page – i then emailed it to my sister in law, mother and about 6 of my friends who have littl kids!! we love them and if you lived closer we would ask you to be our friend!! ;-) I also love your playroom!! Cant wait what is still to come on your blog! Okay, I’m so glad I’m not the only mom who goes to playgroups (or library story times) hoping to make friends with other moms (I’m from the U.S.). I think your ice cream cone idea is just darling, and I only wish you lived closer! What is with people?! I thought you did a great painstaking job! I will be your friend!